Hill City coach Travis Desbien noticed Conner Born’s talent when he was a freshman. Born played well on the junior varsity. As a sophomore, Born started on defense and saw spot offensive time. Prior to the 2017 season, Desbien expected a quarterback battle between Born and Ethan Hamel. Then, Born decided to not play football for personal reasons and watched as the Ringnecks finished 5-4. At the end of the fall, Born approached Desbien. Born has quickly emerged as one of the state’s top breakout players. He has helped Hill City start 2-1 behind an offense that has tallied 177 points, third-most in the classification. This week, the Ringnecks play host to unbeaten Clifton-Clyde in an intriguing District 7 opener. Clifton-Clyde is ranked fifth in the classification. The game will start at 4 p.m.
Born has completed 15 of 33 passes for 254 yards with five scores against zero interceptions. He has rushed 52 times for 652 yards and 12 touchdowns behind a young, injury-plagued offensive line that started freshmen at both guard spots and center last week. Born is by far the state eight-man leader in rushing yards, according to MaxPreps’ state lists. He is third in total yards. Freshman Cody Presley has started at center throughout the year. Senior offensive guard Aaron McDowell is out with injury and likely won’t return for several more weeks. Junior Jacob Larson is at right guard. He had a concussion against Osborne and should return this week. In the summer, Born was expected to again have a quarterback battle with sophomore Jayce Hamel, who rushed for 544 yards as a freshman. However, Hamel severely injured his hand on a throw in summer work. He missed the season-opening 88-76 road loss at Osborne. Offensively, Born gained the state’s attention. He passed for 80 yards and two scores and delivered 19 carries for 396 yards and seven TDs. Hamel has played the last two weeks, mainly in the backfield and at defensive tackle and helped the Ringnecks defeat WaKeeney-Trego (48-18) and Thunder Ridge (53-6). All three of Hill City’s opponents are 2-1. Journigan, last year’s Mid-Continent League’s eight-man special teams player of the year, has moved to the backfield. He has 30 rushes for 247 yards and four TDs, along with 199 defensive/special teams yards. McDowell has stepped up with a team-high 47 tackles in his first year at linebacker. Born and Journigan rank second and third respectively with 31 and 28 stops. McDowell credited Desbien, in his second year as head coach and a player on Palco’s ’05 state runner-up team, and longtime Hill City assistant Vince Walker for helping him to learn the new position. McDowell, a cornerback and safety in the past, has focused on the “read step” to make plays. District 1 blends teams from Three Rivers League and the South Central Border League. Sedan and Oswego enter district play unbeaten and will square off on Friday night at Arrowhead Stadium in Oswego. The Blue Devils have opened with road wins at St. Paul and Oxford, and a 36-point home victory over Marmaton Valley last week. Sedan has not made the playoffs since joining eight-man football in 2010 despite two seasons with an 8-1 record and another finishing 7-2. Oswego has posted big wins over Chetopa and Altoona-Midway and slipped by Marmaton Valley 30-22. Coach Matt Fowler is trying to build the Oswego program into the consistent contender that his former school Spearville has become. Junior Jace Wilson has led the Indians with 462 rushing yards and seven touchdowns through three games. Another key district game this week has Central Burden visiting West Elk. Central Burden has been competitive in consecutive losses to Argonia-Attica and Udall. Meanwhile, West Elk will try and qualify for the postseason for a fourth consecutive season. The Patriots are led by junior Nic Moreno’s 459 rushing yards and four scores. Cedar Vale-Dexter was shut out by Caldwell last week after scoring 112 points the first two weeks. The Spartans are led by sophomore Brogan Myers who has rushed for 481 yards and nine scores. Cedar Vale-Dexter opens district play this week against a Flinthills teams that just ended a 35-games losing streak with last week’s victory over Oxford. District 2 may be the deepest in the classification. Three teams are unbeaten entering district play, while two others, Medicine Lodge and South Central, have only one loss to third-ranked Hodgeman County. South Central fell to Hodgeman County 28-14 last week, while Medicine Lodge lost to the Longhorns 36-24 in Week 2. South Central may have the signature win for the district with the T-Wolves’ 24-8 victory over traditional power Spearville. 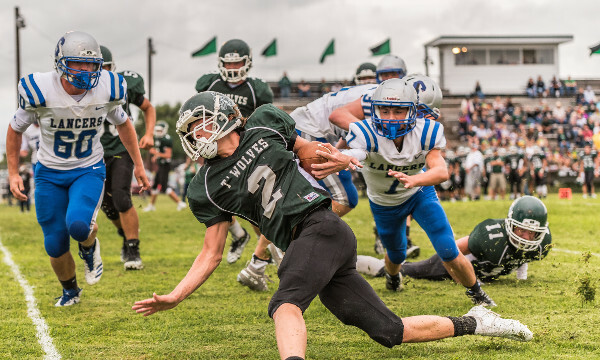 Chayde Snyder leads the T-Wolves offense with 285 yards and five scores on the ground. Medicine Lodge is led by the explosive connection of Garrett Burden and Dakota Bayliff. Burden has thrown for 875 yards and 14 touchdowns, with 563 yards and eight scores going to Bayliff. The Argonia-Attica Titans also figure to challenge as quarterback Blake Harnden has thrown for nearly 450 yards and five scores. The Titans have three solid wins over Hutchinson Central Christian, Central Burden, and Pratt-Skyline. Udall and Caldwell are also unbeaten entering Week 4. Caldwell averages nearly 59 points per game and has yet to be tested. Meanwhile, Udall has survived a 4-point victory over Central Burden. The Eagles are led by junior Josh Fielder and sophomore Dylan Bishop who have each rushed for more than 300 yards and combined for 13 scores. Finally, Oxford has struggled to a winless start while giving up nearly 47 points per game. Burlingame returns only a handful of starters off of last year’s state semifinal team, but those that are back are difference makers. The Bearcats are led by seniors Montana Giffin and Seth Greenwood. Giffin has thrown for 353 yards and six scores and Greenwood has 361 rushing yards and eight touchdowns. Burlingame has rolled to a 3-0 start, although their opponents are a combined 1-8 on the season. Madison has opened with three consecutive shutouts and is the only eight-man team yet to allow a point. The Bulldogs will get tested this week with a road trip to Maranatha Academy. The Eagles are averaging 70.7 points per game behind quarterback Nate Burdette and receiver Brock West. After a season-opening loss to rival Waverly, Lebo has rebounded with wins over struggling programs in Marais des Cygnes Valley and Chetopa. The Wolves got 170 passing yards and four touchdowns from Devan McEwen. Valley Falls has lost two straight since a wild 54-48 overtime win over Onaga in the season opener. Chase County’s first season in eight-man football has began with losses to Herington, Canton-Galva, and Peabody-Burns. Entering the season, District 4 was expected to be one of the weaker Division I districts as no team reached the playoffs last year. However, the district has collectively posted a nice pre-district record. Solomon, a potential preseason breakout team, has played well with two blowout wins and a 48-34 victory against Moundridge last Friday in a game the Gorillas led 40-8 at halftime. Solomon has averaged 273 rushing yards. Senior Braden Neilson has passed for 189 and rushed for 262 with 12 TDs accounted for. Bennington has again posted a solid defense with just 22 points permitted after 26.7 allowed in a 6-3 season last fall. The Bulldogs permitted 52.7 points per contest two years ago. Canton-Galva earned a high-quality Week 3 win against Lost Springs, a top-10 Division II team, with a 66-28 road victory. Canton-Galva has scored 136 points in its second straight 2-1 start. Goessel has matched last year’s win total and is 4-3 in its seven contests. Before that, the Bluebirds had a seven-game losing streak. Herington is one win off of last season’s record and has averaged 41 points a contest. Last fall, the Railers tallied 21.1 a game. Peabody-Burns fell to Lost Springs and Little River before a 46-24 victory at Chase County last week. The Oilers have been ranked in the top-two of the classification all season and have posted 222 rushing and 98 passing yards a contest, along with 14 sacks. Central Plains has not lost a district game since 2012. Senior Alex Hickel has 213 rushing yards and five TDs. Senior Brett Liebl has 8.5 sacks. Little River has been dominant with wins versus Canton-Galva (52-20), at Peabody-Burns (48-0) and at Bennington (44-12). The Redskins have 24 players with seven seniors and have averaged 228 rushing yards a game against 21 passing yards a contest. Sophomore Graham Stephens, senior Hunter Thomas and junior Brayden Sears all have between 144 and 271 rushing yards and have a combined 15 rushing scores. Moundridge, in its first season of eight-man football, opened with a 42-6 win against Goessel and then have two losses by a combined 20 points. Macksville has averaged 210 passing yards a contest. Senior Kody Mead has completed 42 of 66 passes for 623 yards with a 14/2 TD/INT ratio. Pratt-Skyline opened with a 54-6 road win versus Burrton but has scored just 22 points in the last two contests. St. John has dropped seven straight contests. Hodgeman County, last year’s Division II state runner-up, has posted an impressive resume with road wins against Dighton and Medicine Lodge and a key home victory versus South Central in a battle of top-five teams. The Longhorns have averaged 239 rushing yards a contest, including 392 and six scores from junior Eli Salmans. Sophomore Isaac Salmans has thrown for 154, rushed for 284 and accounted for six TDs. Sophomore Conner Ruff leads with 31 tackles. Kiowa County is 3-0 for the first time since its 10-1 season, its best year in school history. Senior Cale Thompson has thrown for 298 yards for six scores, along with 78 rushing and two TDs. Junior Koby West has seven TFLs. Ness City played Central Plains until late in the game in a close Week 1 loss. Senior quarterback Angel Guzman has accounted for six scores. Spearville has started solidly under new coach Travis Callaway, including a big season-opening victory versus Satanta. Junior Carson Rich has 47 carries for 343 yards and six rushing TDs. After a 7-2 season last year, South Gray lost by four at Satanta and by 31 to Medicine Lodge. Kinsley ended a 22-game losing streak in Week 2. Led by senior Drake Steinbrock, Clifton-Clyde has outscored teams 168-20. Sophomore Aiden Rudolph is a returning starter under center. Victoria returned senior quarterback Cooper Windholz and has again developed strong new talent, such as sophomore running back Jayvon Pruitt and junior lineman Kirk Huser. The Knights have posted a winning season every year since 1999. Hill City has scored 177 points, third-highest in the classification, behind breakout senior quarterback Conner Born and a young offensive line that has overcome injuries. Lincoln quarterback Drew Biggs has helped the Leopards open 2-0 with new coach Dustin Patee. Washington County finished 0-9 last season in 11-man football but has been significantly more competitive this year with wins versus Doniphan West (38-12) and at Valley Falls (52-6) with a 12-0 home loss to Thunder Ridge in Week 2. Stockton defeated Sylvan-Lucas, 54-26, in Week 2, a squad that then mercy-ruled Lincoln last week. Defending state champion Hoxie again posts a great defense with its mammoth offensive line of Taye Washington, Colton Heskett and Jarrod Dible. However, the skill players, like senior quarterback Jared Kennedy and junior running back Wylie Weems have stepped up. Weems has 382 rushing yards and eight scores, while Kennedy has accounted for 10 TDs. Wichita County is off to its best start in more than 14 years under new coach Brant Douglas. Junior quarterback Kayde Rietzke has enjoyed a breakout year with 28 of 36 passing for 381 yards with a 10/1 TD/INT ratio. St. Francis, with new coach Nick Fawcett, has outscored teams, 120-20. The Indians have lost just one regular season contest in the last four years. Oberlin has matched last year’s win total with junior running backs Colton Ketterl and Dawson Kempt. They have combined for 457 rushing yards and four scores. WaKeeney-Trego is 7-2 combined in the first three weeks of the fall in the last three years but has struggled after that. The Golden Eagles have just one winning season in the last five years. Senior Dallas Schneider has rushed 62 times for 414 yards and four TDs. Atwood has battled after just one starter, sophomore Cyrus Green, returned. The Buffs have losses by 38 and 18 points sandwiched around a 50-44 victory against Quinter in Week 2. Oswego, Sedan, Cedar Vale-Dexter, Central Burden, Flinthills, West Elk, Argonia-Attica, Caldwell, Udall, Medicine Lodge, South Central, Oxford, Burlingame, Madison, Maranatha Academy, Lebo, Valley Falls, Chase County, Solomon, Bennington, Canton-Galva, Goessel, Herington, Peabody-Burns, Central Plains, Little River, Macksville, Moundridge, Pratt-Skyline, St. John, Hodgeman County, Kiowa County, Ness City, Spearville, Kinsley, South Gray, Clifton-Clyde, Hill City, Lincoln, Victoria, Washington County, Stockton, Hoxie, Leoti-Wichita Co., St. Francis, Oberlin-Decatur Co., WaKeeney-Trego, Atwood-Rawlins Co.